Ok. I want to finally get some things done in my theater again. One thing that I was following was making my own DIY acoustic panels for the walls and then covering them in customer printed fabric that was still acoustically transparent. This means anything can be printed up and still not hurt the function of the panel. I was thinking about getting six movie "posters" printed on the fabric to wrap them in. Put 3 on each wall appropriately and maybe a larger 7th one on the rear wall with the theater "name" on it or something. DIY Custom-Printed Movie Poster Acoustic Panels - cheap! My wife thinks that will look tacky. I still want/need acoustic panels, but my room is so plain, I don't know what else to do. I don't want shelves of movie knick-knacks since they will just add vibration points. I am just at a loss. Here are a couple of photos. The colors are off a bit, but the walls are a subtle brown and the ceiling is a dark chocolate brown. The seats are more of a deeper, rich color than the "red" look. I want to come hang out with you. While I think that the movie-poster-wrapped acoustic panels are brilliant (BRILLIANT! ), you and I both know that Mrs. Buol's opinion should be held in the highest esteem. God, that is a beautiful room. I'd try to find some (large) textile print that she likes that coordinates with the existing colors. I actually kind of like the exposed wood frame in this instance, as you could tie in the colors of the surround speakers, the soffit, the base molding, etc. I mean, if she doesn't want big, thematic, specific art, how about big, generic decorative art instead? While typing this I realized that I am not an interior designer and you should probably just ignore me altogether. But, you know, good luck with that. The crown molding (not shown in the photos) is painted the same dark brown as the ceiling. The baseboard trim should go in this spring as well and it too will also be painted the dark brown. I wonder how hard it is to match the Axiom Boston Cherry vinyl in a wood stain as a potential option. As for the textile print or even some larger "artwork" like design could save some $$$ since I wouldn't be wasting as much fabric since the printed fabric for each movie poster size will have a lot of empty area (the fabric length and width is more than what is needed for each poster size). I could create a color matching design and just cut it as needed. So, you're still on that "what I like matters" train, eh? You've been married long enough to know better. You can never go wrong with basic black panels. I was thinking something similar with art, but not sure if I could find something subtle enough not to be distracting, plus 6 pieces of artwork that would match the room. Of course, there is the same problem with movie posters. I love the movie poster acoustic panel idea. Not really what your thinking about, but I'll throw it out there anyway - how about some big soft fuzzy bean bag chairs. They help acoustically deaden a room and are kind of fun and comfy to fall into when just playing a video game or casual watching. We have 3 big ones for the kids (1 each). 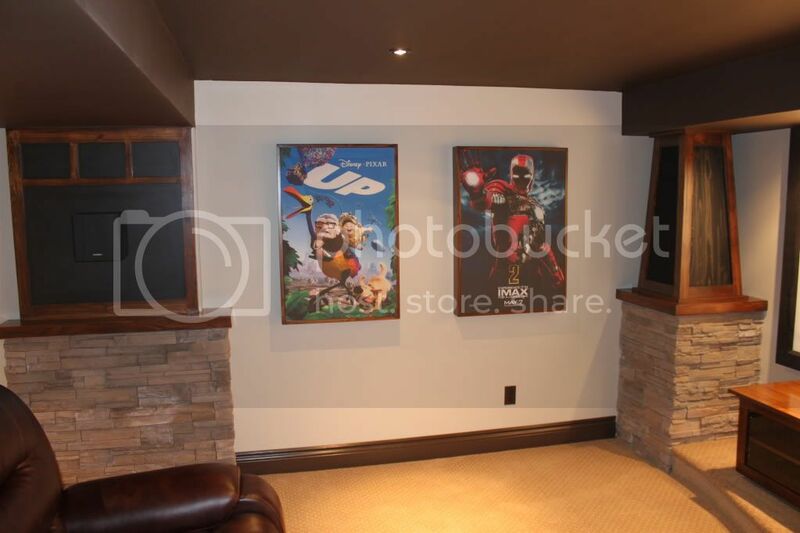 Makes for a neat room feature, plus they can easily be moved anywhere in the theater or house. I also use movie posters. I framed mine on planks and installed a low wattage picture lamp for each (about 9 in the room). The lights give me just enough room lighting along with the screen bias light. For every expert, there is an equal and opposite expert.